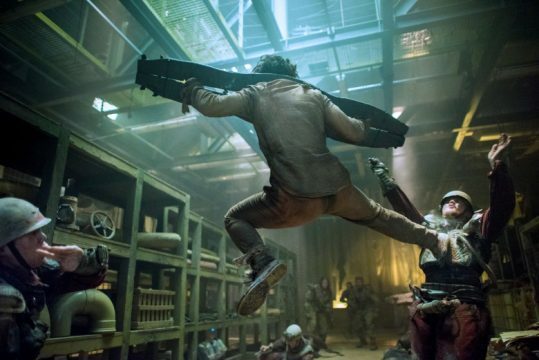 It's not perfect, but Into the Badlands' second season is a major improvement, juxtaposing martial arts sequences with intriguing drama (and some much-needed laughs from Nick Frost). Three episodes were provided prior to broadcast. The first season of Into the Badlands gave us a martial arts warrior who rode a motorcycle through a post-apocalyptic “Badlands” dominated by murderous nomads, opium-harvesting slaves and warring feudal lords. It contained zero smiles or laughs, aside from the occasional moments of violent glee on the faces of its most dangerous villains. The main characters were Sunny (the aforementioned motorcycle-riding warrior, portrayed by Daniel Wu) and M.K., a demon-possessed teenager (portrayed by Aramis Knight) who once murdered a boatload of slaves (while in the possession of the aforementioned demon). Welcome to the second season of Into the Badlands, where much has changed. First of all, M.K. and Sunny are nowhere near one another, after spending the six episodes of season 1 going through the motions of a pretty typical mentoring dynamic. Sunny begins the second season in a chain gang desert setting that appears to have been heavily inspired by the Mad Max films. Meanwhile, M. K. is battling his interior demons in a very literal sense, in a training facility packed with mirrors, candles and adolescent martial arts prodigies. More important than the changes to the plot though are the changes to the tone and quality. This new season is substantially better than its predecessor. Better dialogue, stronger storylines, bigger budgets and prettier landscapes. For one, yours truly found himself won over entirely during a fight scene in which Sunny and Nick Frost’s Bajie (yes, that Nick Frost, of Shaun of the Dead and Hot Fuzz fame) are chained together and forced to fight a sword-wielding barbarian. Of course, the new season isn’t perfect. Some of the dialogue still feels like it was written as a placeholder and then the writers forgot to go back and revise it. But most of it works better than anything from the show’s first year. 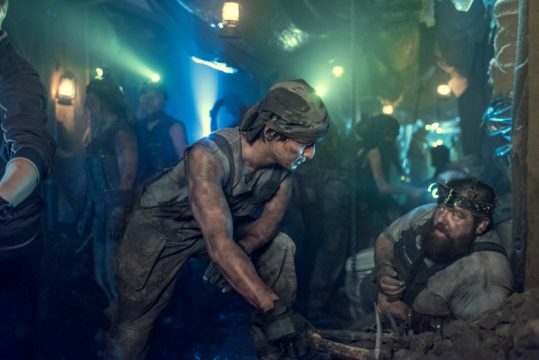 Some lines even get a genuine laugh, due both to strong writing and excellent delivery by Frost, who seems to have joined Into the Badlands just to provide some much-needed levity. As mentioned already, the budget is bigger this year and it shows. Whereas most of the first season’s fight scenes took place on one of three sets, this outing gives us much more variety, including a brutally violent wedding and a disturbing baptism. The wedding scene is both visceral and compelling, while also suggesting that the creators of this show really admire Game of Thrones. At times, the Westeros parallels can be somewhat distracting, including a giant wall, a Queen Margaery imitation (Sarah Bolger) and a Joffrey wannabe (Oliver Stark as Ryder), but it never becomes too much. Aside from the improved budget, the characters are richer and more compelling this time around. The vast majority of them are in far worse positions than they were in the first season, and it makes for better stories and stronger character development. Even the acting seems improved, although the crowded plot does give us too little of some of the best actors. For instance, the show would benefit from more screen time for both Waldo (Stephen Lang) and Penrith (Lance Henriksen of Aliens). Perhaps in a season or two, Into the Badlands will slow down and dwell on some of its more quiet and compelling storylines. Imagine if it took the route of The Leftovers or Mad Men and gave us an entire episode centered around the wheelchair-bound Waldo, or a ponderous exploration of Penrith’s struggles with his faith. That being said, at least some of the characters get a much better arc in this season. Both Lydia (Orla Brady) and the still-alive ex-Baron Quinn (Marton Csokas) are far more compelling this year, largely due to their changed circumstances. Where Quinn once ruled the world from his plantation home, he now lives in secret, wearing deer hides, drinking blood and grappling with mortality. The writers have also paired him up with Veil (Madeline Mantock) in a frightening power struggle, which is sure to escalate into some violent delights by season’s end. The scenes between Waldo and the Widow (Emily Beecham), meanwhile, work better than anything the Widow did in the first season, largely because the writers have taken her from caricature to character. If you didn’t watch the first season of Into the Badlands, jumping right into the second would be a jarring experience, but might still be worth it. If you watched and enjoyed the first season, however, the second will not disappoint. It has all the positive qualities of the first, but with a clearer focus, bigger budget and more compelling narratives. It’s the rare second season where the creators assessed the strengths and weaknesses of the first and gave us a stronger product. If only more shows on television aged with this much grace.